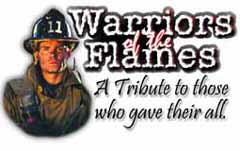 If you are not a firefighter, this song and video will help you understand what it means to be a “Warrior of the Flames.” Order yours today... give it as a gift to a firefighter... give a copy to your local firestation. Honor those who protect you. Fantastic! This is something the fire service has needed for quite some time. God bless you for the time, effort, and insight you have included into this wonderful tribute to our honored profession!! This is a wonderful and very powerful song. We used it at our Installation of Officers Ceremony as a dedication to all the fallen fire fighters. Everyone was moved and wanted to know where to get the video from. May God Bless You and watch over us as we are called to duty! © 2001-2017, JDL Video Productions, St. Louis, MO.